This FreedomPop review looks at a new cell phone and internet service provider that really started to take off in 2014 as more people became aware of their free cell phone and internet service. Yes, as we’ll see in this review, they take a box of chocolates approach. They really do give you something for free, because they assume that, just like you can’t eat just one chocolate if you have the whole box in front of you, you will opt for one of their paid services. Luckily, the paid plans are still really good deals. So, will the company stick around? Well, there have been a couple of companies that have tried to offer free services, and they’ve gone under. However, this time things may be different. FreedomPop has gotten a lot of press coverage, and one of the investors in the company is a founder of Skype, which seems to have done pretty well. Okay, so the first thing we have to do is check the coverage. It turns out that FreedomPop gets its coverage on Sprint’s 4G LTE network. That means that if Sprint has 4G LTE coverage in your area, then you are eligible for these plans. Even if you’re not eligible, you can “Get it Anyway,” though I’m not exactly sure what that means. I think it means that you get access to their 3G service if your device is 3G compatible. Otherwise, what would be the point? You can look up the various cities in your state that are eligible by clicking through their coverage links. You can also enter your zip code in a form field and check directly. For example, in one case (mine), there was no coverage, but there was coverage in the nearby towns. 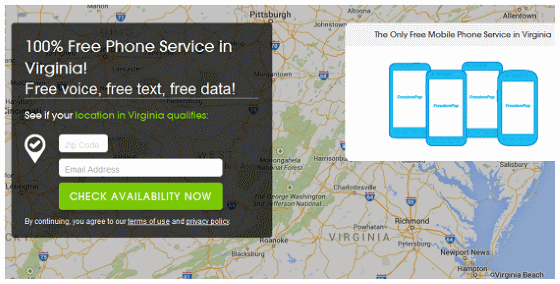 There are two different maps: one for cell phone service and one for data. However, both maps appear to look the same. So let’s start by talking about the cell phone plans. The Basic Plan offers 200 voice minutes and 500MB data per month. This is actually pretty great. The last company to offer free cell phone service only offered 20 minutes voice free per month which meant you could really only use it in an emergency. However, 200 voice minutes is quite feasible for many who don’t use the voice services all that much. Extra data costs 2.5 cents per MB more. The curious thing about this plan is that it doesn’t mention anything about text messages. This can’t be an accidental oversight, so I presume that text messages are NOT included in the free plan. In fact, sending or receiving texts probably bumps you up into the next plan. One workaround may be to use an app like WhatsApp to receive your text message via the data channel. If you need more than 200 voice minutes, then the so-called “Unlimited Talk/Text Plan” could be for you. As you may have guessed, you get unlimited voice minutes and text messages. The data allowance is the same as above at 500MB with overages costing 2.5 cents per MB. This plan costs $10.99 per month or $79.99 per year (which works out to $6.67 per month). Paid annually (or even monthly) this is a great rate for unlimited voice and text. Frankly, as long as the phones actually work (especially when you need them to), these rates are much better than almost anything else out there. Only the Republic Wireless plans come close. Finally, since many, if not most, people use a lot more data on their phones watching videos and uploading and downloading photos from Facebook, Instagram etc., there is another plan. 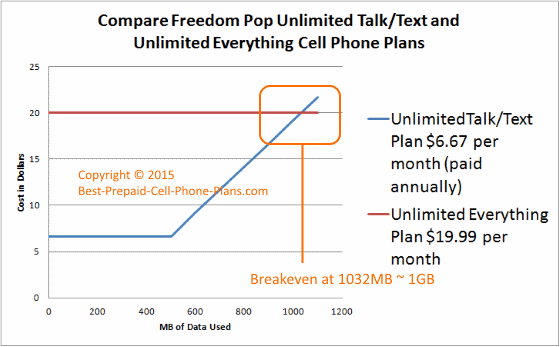 The Unlimited Everything plan includes unlimited voice, text, and unlimited data. The first 1GB of data is delivered at 4G LTE speeds, after which it may be throttled down to 3G speeds. This unlimited plan costs $19.99 per month. So one question you might want to ask is how much data would you need to consume for the unlimited data plan to be worth it. So if you use less that 1 GB of data (this includes all data, not just high-speed data) and you don’t care about the speed of the data, then you can stick with the cheaper plan and still expect to pay less than $19.99 per month even including the overages. If you watch a lot of videos, then you’ll probably want to switch to the Unlimited Everything Plan. 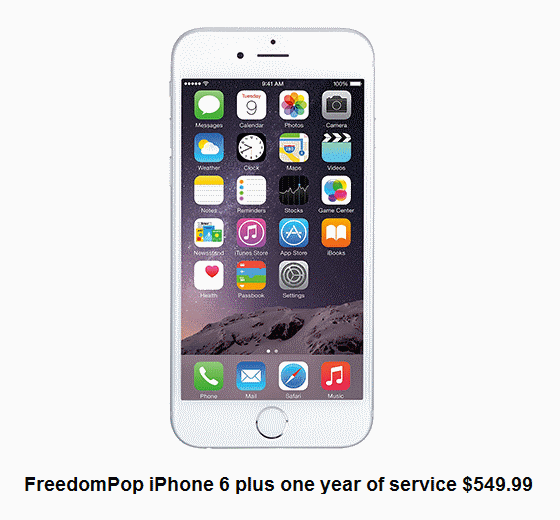 The first thing to note is that FreedomPop only sells smartphones. They figure that their target customers only use these handsets anyway, and they’re more likely to upgrade to a paid plan. If you were the type who would get an old flip phone on their free Basic plan, you would probably be all set, and you wouldn’t need to upgrade. That, however, is not an option. Through a separate site (StackSocial), you can get both the iPhone 6 ($549.99) and iPhone 5 ($249.99) along with one year of service included for what is basically the price of the phone itself. Here’s a quick list of some of the Android handsets available with a brief list of main features. ZTE Force has a 4-inch screen, 5 MP camera, 1.5 GHz dual-core processor and costs $89.00 making it the most affordable phone in their lineup. Samsung Galaxy SIII - costs $139.00, which is pretty reasonable for a phone that still compares well to some newer basic models. Samsung Galaxy S4 is a bit pricier at $269. HTC Evo 4G LTE which also costs $299. The LG Viper which is also a 4G LTE phone costs $119, a relative bargain category. For some reason, they still sell the Galaxy SII for $119, but is not recommended. You can still get the Samsung Galaxy SIII plus one-year of service for $119.99 from StackSocial. This includes unlimited talk and text and 500 MB per month of data. Other features available include visual voicemail and private VPN access to protect your privacy. After one year you can choose from among affordable pay plans or even switch to their free plan. You can choose to bring your own phone if it’s on the list of devices they support. 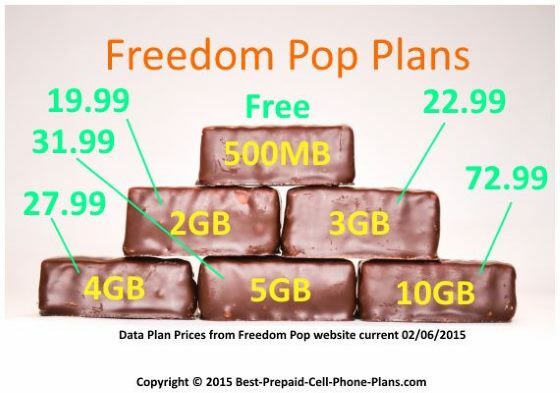 FreedomPop is probably actually more famous for its internet service than for its cell phone service. It all started when they signed agreements in 2012 to use the Clearwire 4G WiMax network along with Sprint's 4G network. Again they have a free plan, but they want to entice you to upgrade to one of their paid plans. The basic plan gives you 500 MB per month. Overages cost 2 cents per MB. You can pay $1.99 per month to receive a usage alert when your balance drops below 200MB. After that, there is a whole slew of plans with data allowances from about 2Gb all the way up to 10GB. Some of these plans (it’s not clear) also include unlimited access to their network of Wi-Fi hotspots. I could construct another graph as above, but in this case, what plan you choose is most likely to depend on whether this will be your primary way of accessing the internet or just something you need occasionally such as on a short trip. FreedomPop seems to test a few different prices for each level of data, but the costs go roughly as in the picture at the beginning of this review. In order to use their plans, you have to order one of their broadband devices. The names of all the devices begin with, as you might have guessed, “Freedom”. Little information is presented about the devices, although details about them are probably available elsewhere under the original device name. The specs of all the devices are pretty similar. They all seem to support wireless connections for up to eight devices, and they can run on battery power for up to six hours (depending on the amount of data traffic). A couple the devices appear to only work on the faster 4G network. This is great, but if you’re in an area without 4G coverage, you would be out of luck. If that is likely to happen, you can opt for one of their devices that can also operate on the 3G network. One of the more interesting devices they offer is something called a Freedom Sleeve Rocket that turns your iPod Touch in a mobile hotspot. The puzzling thing is that they claim that this means it turns it into an iPhone. I supposed you can then make Wi-Fi calls on it, but that doesn't exactly make it an iPhone. You can also get a device that looks like a Cable modem or FIOS router and access the internet at home. 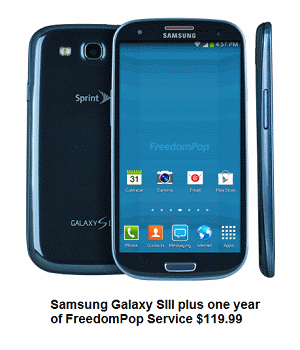 FreedomPop also offers a small selection of tablet computers that you can use with their plans. The prices don’t appear discounted at first glance, but you have to remember that these devices include the capability to access the 4G/3G cellular network. So you can’t compare them to the Wi-Fi only versions. Actually they do carry one Wi-Fi only tablet, the Freedom Tab Liberty. Most people will probably opt for one of the other two choices: the Samsung Galaxy Tab 3 or the iPad Mini. One thing I may have mentioned briefly above or below is that Freedom Pop has built up a network of Wi-Fi hotspots, and you could take advantage of them to save on your 4G/3G data usage. One of the small concerns I have is that the sign-up process is not as straightforward as I would like. The website doesn’t show you all the plans unless you go hunting for them. Still, this review should help you on that front. I had contacted email support with a question about what would happen if you wanted to upgrade from a plan for which you had paid the annual fee. They said they would credit the payment toward the new plan, but they took about two weeks to reply to that email! So if you want answers, I suggest calling them. Problems reported earlier about being hit with unexpected overage charges seem to have gone away, as you can now choose whether to have overcharge billing start when you run out of data or have the data spigot turned off. There is an optional $1.99 per month charge for getting warnings about when your data is running low. That seems a little ridiculous, but then again, it is optional. Freedom Pop is now available at the few online retailers, but you can also get it directly from them. If you sign up for one of the paid plans, there’s usually a one-month free trial. Or you could just sign up for the basic plan which has no cost, though you still need a cell phone, tablet or broadband device. Here are some other plans that may interest you. Unlimited plans are available from most providers these days without a contract, though phone selection can be limited. Check the links on the left hand menu for further info. Smartphones offered ranges from basic devices under $20 to the latest gadgets, though these can run to the $600 to $800 ranges which are, afterall, their actual costs. You should try to make get some kind of extended warranty if you go with one of the higher prices handsets. Some people like to pay for their phone and phone service for a year. This is possible with plans that offer extended airtime cards. Such plans include Tracfone, Net10, T-Mobile and PTel.